Other than having fun editing pictures, what use is a camera? 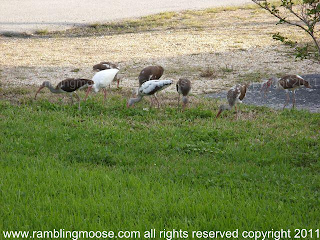 In the case of this particular picture, I was able to catch a flock of egrets land in a neighbor's yard and start to feed. I don't know why birds decide to chose one particular spot to feed, but it must have looked tasty. Around here, you get used to seeing egrets. One here or there, they are fairly common to see, about as common as the flocks of feral parrots that scream through the sky or the hawks and buzzards hovering near sunrise or sundown. On the other hand, usually when I see an egret, it is just that, "an" egret. This particular day I was blessed by a flock coming by. They landed on the roof, first by the lead bird, then the rest of the flock. One by one, led by that pilot, they landed on this particular spot of weeds and began to feed. As some of my friends are fond of pointing out around here, if you plant native species, wildlife will come. I can look out any window and expect to see natives pass through, but they may not stay if they don't like what they find. The curious thing about this flock of egrets is that they are on and stayed over a line. The line separated the "Nice Green Lawn" of one property from the "Nasty Unkempt Weeds" of the one next door. The Weed strewn lawn was that way because the house was not cared for since it was sold by the owner back in 2007. It was then bought by a character that we of this block are happy to see the end of. He basically walked away, brought in a house hold of 20-something bar crowd partiers that eventually moved on. After the partiers moved in the younger set of an "Old Wilton Manors Family" who began to take better care of the place. At least the place stopped it's decline. All of that wordy prose leads me to wonder if we all let our lawns go more natural, might we not see more nature? One of my regular readers, Constance, told me that I was mistaken. I saw the white bird above and thought it was the Egrets that sometimes land around here. 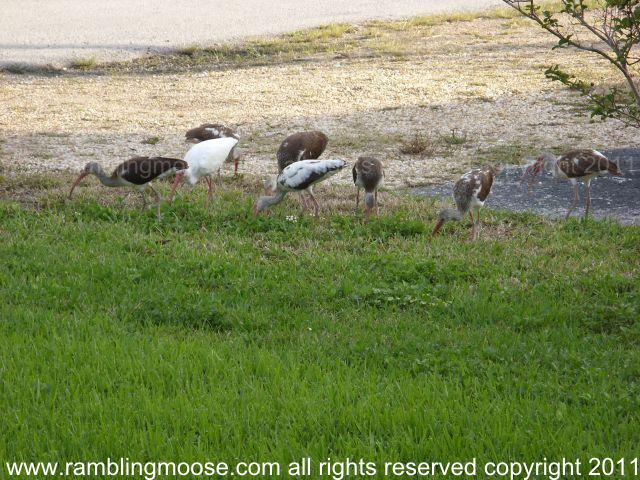 This flock is not, it's an American White Ibis. It looks like "my" flock was an adult and a number of juveniles.